I have had Oscar, my Orange Wing Amazon parrot since 1986. It's entirely possible that he will outlive me. That is common with the midsized and larger parrots, they have long lives, and there was a Yellow Naped Amazon who lived in Homer Alaska to the ripe old age of 106. Yeah, Alaska. Of All Places. You end up having to find coping strategies with them. You see, it's not like with a dog. Dogs bond in a pack mentality, friends is a good way to describe it. You work together as a team, even if that work is sitting on your lap and keeping you comfortable. They do jobs, they give you companionship, they give you help in many different ways, and they give you love. I have even heard a pretty good discussion as to how the Human Race would not have survived had it not been for the assistance of the dog. But Parrots? Well they're a very strange creature in their own right. You see where Dogs see you as a co-worker, Parrots see you as a mate. Yes, for 29 years I have had a small green mate in my house. It takes getting used to. There are better bonded parrots. I had a Goffin's Cockatoo named Sonny who was so closely bonded to me that he would "get loud" until I opened the cage, and no matter where I was in the apartment, he would then hunt me down so that he could be near. Then he would act silly. Backflips, barking, chattering, and the like. 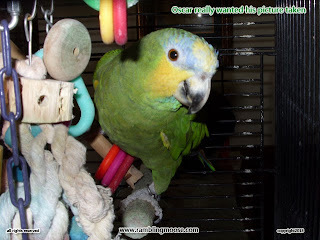 Squeak, my Grey Cheeked Parakeet used to ride all over Chestnut Hill, Philadelphia inside my shirt. I would walk into shops, he would climb out just enough to see where he was, then if he liked the people there, he would climb out to say hello. grouch. It's a coincidence that he's green like the Sesame Street character and that was what got me calling him that. He will interact with you but only on his terms. I am his favorite person, which is to say he won't shred me to pieces with that beak of his all of the time. I can get him to go back into his cage when I say "Go Home", and he shows his appreciation by talking to me. At sounds louder than a Jet Engine at 3 in the Morning. So I have learned. He is an intelligent creature and requires mental stimulation. If he doesn't get it, he makes his own, learning how to bounce sounds off of walls for echo location, especially if those walls are three blocks away. At least that is what I think he's trying to do. I can't fathom why else 130 db are necessary other than to gauge distance. But there his cage sits on the room divider. I keep oddball things there to keep him from eating the room divider because anything that is wood will be chewed. We would like to keep the divider in one piece since we are somewhat attached to the architectural element of it. I found a long time ago that he will go quiet if I put toys on top of the cage. 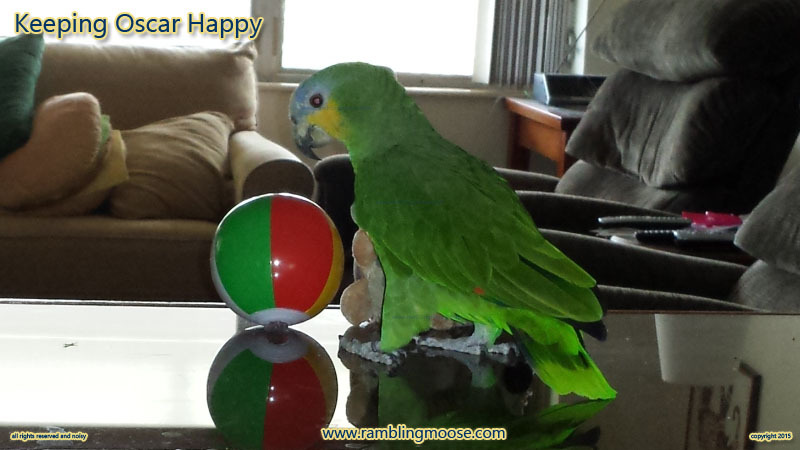 Beach Balls are the best since they are light and too large for him to get his beak around. They also won't destroy anything when they are ejected in his favorite game of "Make the Human Fetch". Anything left on the room divider is fair game to be ejected, to the floor, post haste. Don't leave anything "food related" on there because he does want to sample. Usually at 130 db. Yes, the word Hello gets used loudly and often since he has figured out that I pay attention to it. In his little world, Hello really means "I Want". I want that food you have. I want a shower in the rain. It's like living with a two year old version of Verucca Salt from the Charlie and the Chocolate Factory movies. At 130 db. A pain inducing one hundred and thirty decibels. 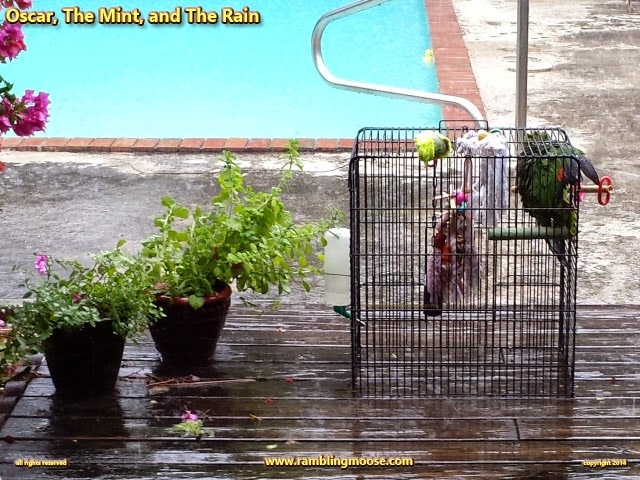 So if you see me covered in rain, parrot feathers, some scattered food, and a couple of scratches on my arms, it's a normal day in the life of a parrot owner. Just don't blink. He'll be into something else real soon.